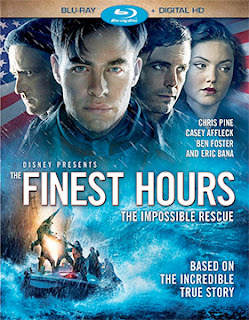 Director Craig Gillespie’s CGI thrill ride, The Finest Hours, which was adapted for the screen from the 2009 tell-all account by writers Michael J. Tougias and Casey Sherman titled “The Finest Hours: The True Story of the U.S. Coast Guard's Most Daring Sea Rescue,” will be heading home as both DVD and Blu-ray selections from Walt Disney Studios Home Entertainment on May 24. Timed for the Memorial Day weekend, this true-life story of the rescue of the crew of the SS Pendleton (an oil tanker that was literally cut in half — the f/x on this film are outstanding) off of Cape Cod on February 18, 1952 by Petty Officer Bernard C. Webber (Chris Pine) and his patched-together crew arrives with an ARR of 116 days. Domestic ticket sales were, however, a disappointing $27.3 million … and that is a shame as this is both a solid, edge-of-your-seat thrill ride and a well-told story. It is now up to the home entertainment group to bang the promotional drums loudly. In its May release announcement, the Criterion Collection placed auteur filmmaker Robert Altman’s The Player on the calendar for delivery as a new 4K restoration on both DVD and Blu-ray on May 24. That was exciting news indeed for film affectionados, so one can only imagine how much that excitement is amplified when the work of one iconic auteur is followed by news of yet another 4K restoration for an important piece of cinema from another one of the 20th Century’s great auteurs, Stanley Kubrick. 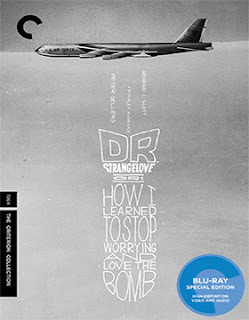 That’s precisely what the Criterion Collection has in store for their faithful followers on June 28 with the release on DVD and Blu-ray of Kubrick’s 1964 Best Picture nominee starring Peter Sellers, Peter Sellers and Peter Sellers, Dr. Strangelove, or: How I Learned to Stop Worrying and Love the Bomb. Bonus features include newly-prepared video sessions with, among others, author Michael Broderick (“Reconstructing Strangelove: Inside Stanley Kubrick's Nightmare Comedy”) and fellow scholar Rodney Hill (“The Encyclopedia of Stanley Kubrick”), as well as David George, son of writer Peter George, whose novel, “Red Alert,” was the basis for the film. 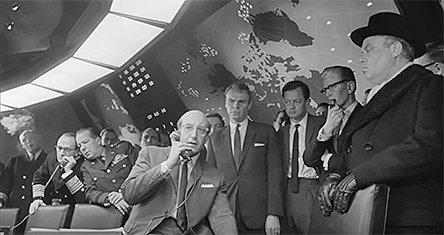 There’s a vintage interview session between The New Yorker’s Jeremy Bernstein and filmmaker Stanley Kubrick, video sessions from 1963 featuring Peter Sellers and George C. Scott and excerpts from the Today Show in 1980 featuring Peter Sellers. Going to the film vaults on June 14, the Criterion Collection has a new 2K restoration of director Alexander Hall’s 1941 Best Picture nominee, Here Comes Mr. Jordan. 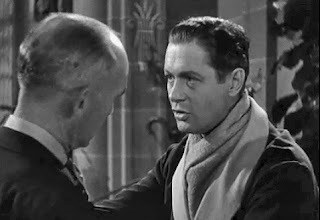 This film adaptation of Harry Segall’s 1938 stage play was nominated for seven Oscars, including Best Picture, Best Director, Best Actor (Robert Montgomery), Best Supporting Actor (James Gleason) and Best Screenplay (Segall shared the Oscar with Sidney Buchman and Seton I. Miller). Bonus features include a newly prepared video session with film critic Michael Sragow and filmmaker Michael Schlesinger, a vintage interview session with Robert Montgomery’s daughter, Elizabeth Montgomery and a 1942 Lux Radio adaptation of Here Comes Mr. Jordan featuring Cary Grant, Claude Rains, Evelyn Keyes, and James Gleason. Other DVD and Blu-ray releases on the June release calendar from the Criterion Collection include director Michelangelo Antonioni’s Le Amiche (June 7), Jean Renoir’s early film sound film (1931), La Chienne (June 14) and director René Laloux’s surreal 1973 film release of Fantastic Planet (June 21). The Big Apple, summer in the city and needy people who suddenly find something mysterious and exciting dropped literally on their doorstep. That’s the hook for Ariztical Entertainment’s Apr. 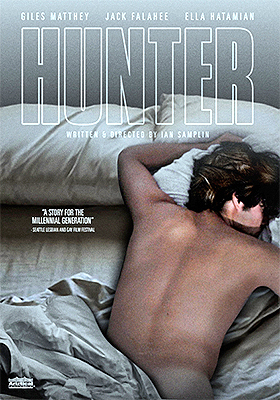 26 DVD debut of writer/director Ian Samplin’s Hunter. Gavin (Jack Falahee — as Connor in the How to Get Away with Murder television series) is an upwardly mobile millennial. He should be the center of attention among his peers, but despite his good looks, an on-track career and decent Manhattan digs he remains aloof; an outsider. He just doesn’t seem to be able to connect to those around him. 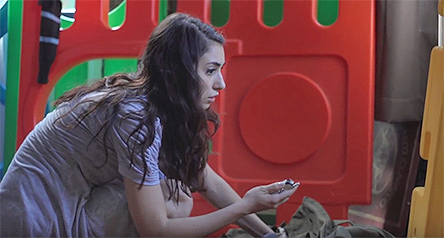 His friend, Amy (Ella Hatamian in her film debut, who is actually an up-and-coming filmmaker; producer — Homemakers, Nightmare Code, The Epiphany, etc. ), is an attractive young woman, with lovely dark eyes, who puts herself out there. It rarely works out. She’s not “connecting” either as witnessed by her latest histoire d'amour, which has just gone up flames. Needing a place to stay until she can work things out, she accepts Gavin’s invitation to bunk at his place … and that get us to that special “something” that they find on Gavin’s doorstep when they return home from dinner and drinks. His name is Carter (Giles Matthey — as Claude Crane in the True Blood television series) and he passed out on this particular doorstep; random. They bring him in, park him on the couch and thus begins a weekend full of Hitchcockian MacGuffins as the two find themselves attracted to the mysterious stranger. The more they learn about him — his secrets — the more each of them wants to know. It soon becomes a competition of seduction … but who is the seducer and who is the seduced? Is Gavin a drifter; a loner … or a gamer? Filmmaker Ian Samplin keeps us guessing and allows the sexual pheromones a free reign in Hunter.